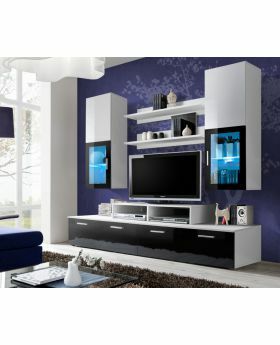 High-gloss black modern wall unit with blue LED lighting. Our collection of custom wall units made by European premier manufacturers of furniture is sure to amaze you. Almost all completely customizable. TOLEDO collection is a versatile system for all rooms within the home, offering compositional freedom. 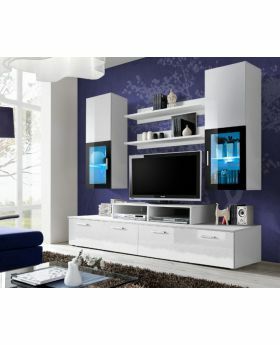 Storage units, shelves, benches and hanging cabinets create this modern wall unit system. Available in 3 color combinations: black, white and black and white. H - 190 cm / 74,8"
W - 200 cm / 78,8"
D - 45 cm / 17,7"
2 Wall Cabinets with LED lighting and 2 shelves - 120/40/29 cm - 47,2"/15,7"/11,4"
2 Shelves - 20/100/20 cm - 7,9"/39,4"/7,9"
DVD shelf/harbour: 18/100/30 cm - 7,1"/39,4"/11,8"